Costume jewelry is worn to make a statement, a shorthand way to convey both one’s mood and sense of style. Former secretary of state Madeleine Albright famously chose her brooches to send signals to the world’s heads of states. But long before Albright was using costume jewelry to deliver subtle messages to adversaries and allies alike, women in the 1920s and ’30s wore fashion pins and bracelets to communicate who they were. Literally. One of the biggest names in monograms was Monocraft, founded in 1927 by brothers Michael and Joseph Chernow. “Michael and Joseph lost their father to cancer when they were barely in their teens,” says Vega. “As the oldest of seven children, M & J, as they were known, took over their father’s shirtwaist factory out of necessity; they felt that it was up to them to provide for their family.” Monocraft grew out of that familial sense of duty. Monocraft’s first hits in the monogramming business were plaques for cars (above, left). When the Depression hit, it turned its attention to monograms for handbags (above, right). Monograms for car doors were the brothers’ first hit. As Vega writes in her book, “Apparently it was Michael who noticed it could take as long as two hours to hand paint initials on a car door. He was convinced it could be done faster and much more efficiently.” At first they sold decals, but soon they were offering a line of silver or 22k gold-plated plaques, which had empty spaces for initials and, in some cases, crests. 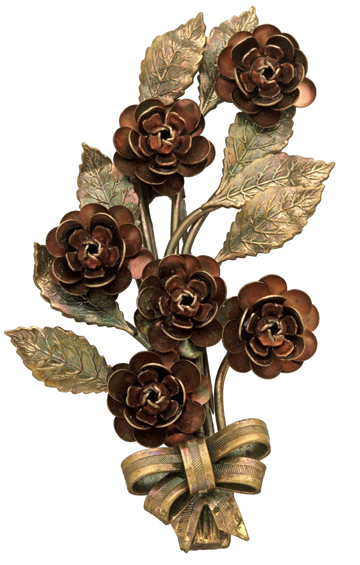 A clip from 1939 with copper flowers and gold-plated leaves. 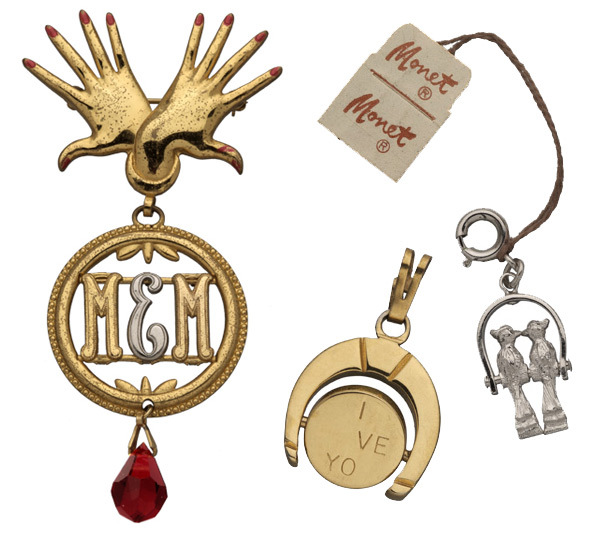 Monocraft’s focus on metal initials for handbags gave them a presence in department stores, and buyers, seeing how popular the monograms were, urged the Chernows into the costume jewelery business. The Chernows resisted at first, testing the waters by making monongram pins, bracelets, and other pieces. “They never did anything quickly,” says Vega. In fact, it took until 1937 for Monocraft’s first, tentative foray into costume jewelry to come into full flower in a line called Monet. 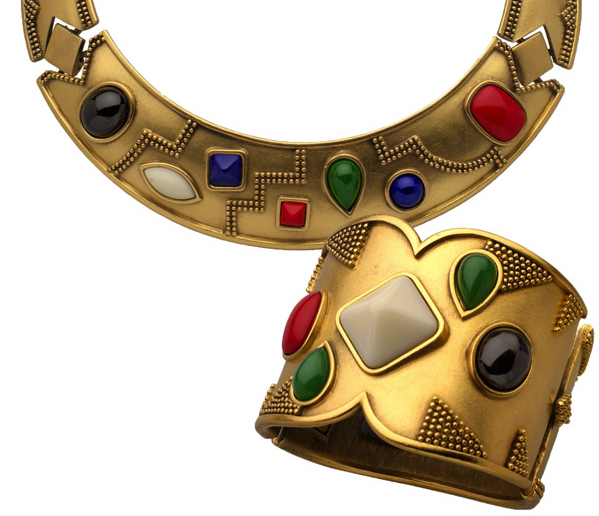 The marketplace for costume jewelry was just beginning to get crowded. Former Van Cleef & Arpels jeweler Alfred Philippe put Trifari on the map with a series of crown-shaped pins. Coro was doing well with its Duettes pins, Hobé was known for its tasseled and beaded necklaces, and Eisenberg was covering just about everything it produced in Swarovski rhinestones. Even fashion designers had their own lines of costume jewelry, from Coco Chanel to Elsa Schiaparelli to Hattie Carnegie. This dangle pin (above, left) from the mid-to-late 1930s seems a bridge between Monet’s monogramming roots and eventual prominence in the charms trade. The Monettes pieces (above, right) are from 1959. 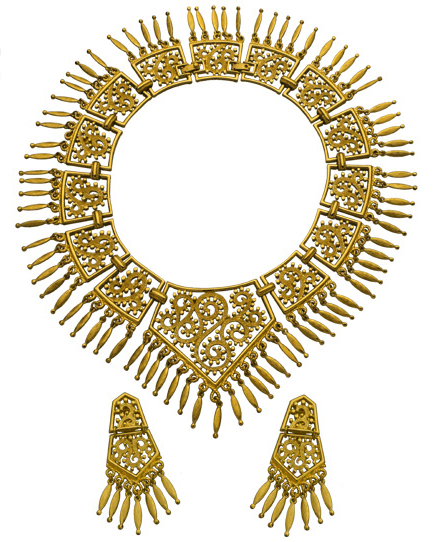 Egyptian and Art Deco influences can be seen in this 16-inch, gold-finished necklace from the late 1930s. While some of Monet’s bracelets and brooches from the late 1930s featured faux emeralds, rubies, and sapphires, many more explored the possibilities of different types of links and box chains. From these chains hung Art Deco and Egyptian revival shapes, enameled bells, and gold-plated balls. Brass was a typical base metal at the time. Like just about all U.S. manufacturers, Monet shifted gears during World War II, converting much of its Providence, Rhode Island, factory to the production of ammunition and torpedoes. During the war, Monet was chosen as an official supplier of victory jewelry for the British Royal Air Force; a portion of the proceeds from sales of these pins was donated to Bundles for Britain, which aided civilians affected by German bombing raids. Monet was the first costume jeweler to attach spring-loaded rings to its charms, making it easy for people to mix and match. Pieces created by Monet during the war years included gold-finished sterling silver (vermeil) animals with enamel details. The menagerie ranged from lambs to bears to giraffes, all of which could be pinned to a lapel. Stylized florals, plumes, and bows were also produced, as were earrings in the shapes of seashells and vases. After the war, Monet got back to the business of producing serious fashion fantasies. Chokers with matching bracelets and earrings were marketed with names like Boladora, Alladin, Tuscany, and, yes, Fantasy. In some pieces, Granville paired the warm hue of vermeil with even warmer pink gold. When pearls became popular in the 1950s, Monet answered with multiple strings of gradated basic pearls that were gold or silver-plated. As youth culture took hold, a teen-oriented line called Monettes was introduced. Other pieces seemed to reflect the minimalism of Mid-century Modern by incorporating beads and blocks of clean, white resin into their design. Seemingly there was nothing that Monet and Granville could not do. The Paisley series from the early 1970s captured the spirit of the 1960s, as well as the international aesthetic of Monet designer Elda Krecic. Monet figural pins include a Spinneret Clown from the early 1960s, an enameled butterfly from the early 1970s, and a resin poodle head, also from the ’70s, that’s accented in gold. 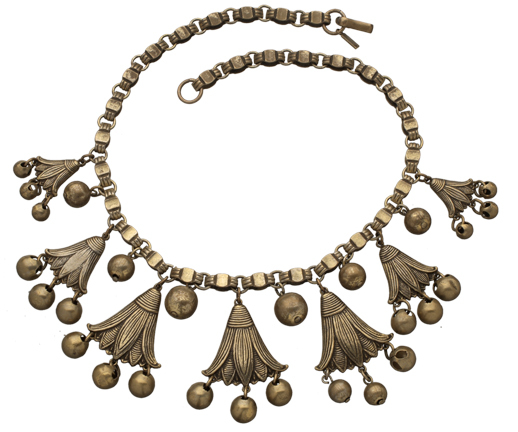 The 1970s saw lots of gold-tone necklaces with an exotic, international flavor to them, from the curlicues of the Paisley pieces to the lariat necklaces of Espirit, Metropole, and Musette. Monet also established Ciani, the first line of branded fine jewelry sold in department stores. 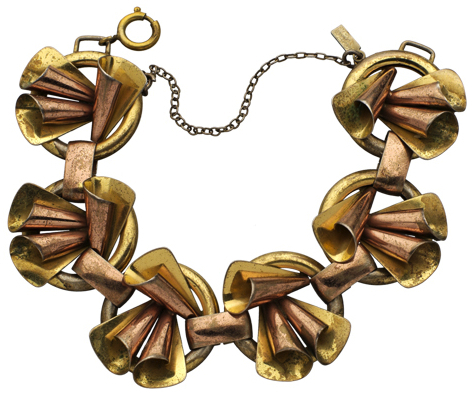 Ciani pieces incorporated materials from 14k gold and sterling silver to copper and even ivory. The Zantium series from the 1980s signaled Monet’s return to color. 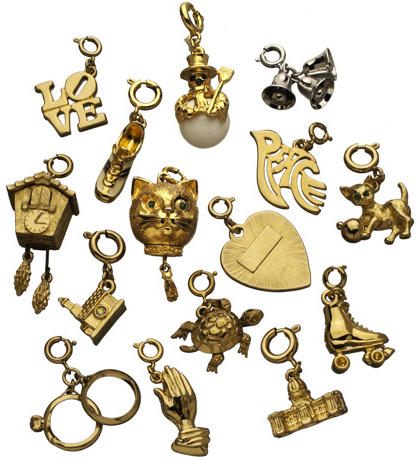 Beginning that same decade, a separate seasonal line of white jewelry also became a prominent part of the company’s visual vocabulary, in the form of conversational pins (the gold-accented resin poodle head from 1970 is especially charming), necklaces, bracelets, and earrings. In the ’80s, Monet designers re-imagined the colorful pieces the company had experimented with in the ’30s in the Zantium series and others. Monet also had the exclusive license to manufacture a highly successful line for Yves Saint Laurent. In the end, thanks to the Chernows and designers such as Granville, Miozzi, and Krecic, Monet was able to leave the literalism of monogramming behind, using costume jewelry in much the same way as its customers to communicate its sense of style in a single glance. Great article, thank you! LOVE Alice’s book! What does the GR stand for and is this 14 K ? It doesn’t state electroplace or hg or rolled gold. Did Monet make 14 K jewelry ? I’ve found the latest line of Monet jewelry sold at JC penney to be very low quality. The clip earrings still visually made with comfort clips, don’t work, the gradual pressure isn’t there, and the metal plating is very cheaply applied. Did they change manufacturers? Buyers beware, its not the same wonderful product of years past! LOVE and admire the older pieces from the 40’s and 50’s!!!! Classic pieces that I wear on occasion and ALWAYS getting compliments… These Monet pieces are ones my mother wore!!!! Great QUALITY and unique designs!! !